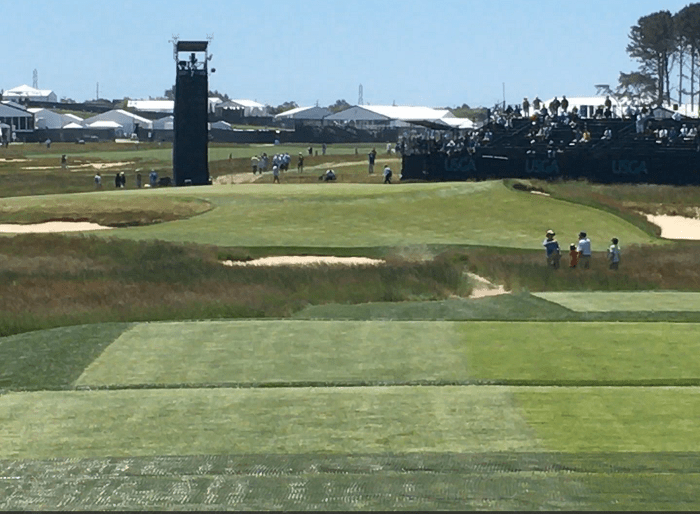 The dust, literally and figuratively, is beginning to settle after the highly charged and highly controversial US Open held at Shinnecock Hills last week. The USGA, in charge of the championship, were accused once again of “losing” the golf course, just as they did back in 2004 when it was last played at Shinnecock. They may just about have redeemed themselves on that front but I’m not so sure that they have got away with their handling of the Mickelson putt-gate affair that occurred on the 13th hole on Saturday. To set the scene, Phil had a slick downhill 20-footer for bogey to a hole perched on top of a perilous slope. It was a super, super fast highway and when he saw it was missing long and on the low side he hurried after it and, while it was still moving, he putted it back up the slope towards the hole again. For a golfer at this level to purposely hit a moving ball is almost unheard of. Lefty was penalised two shots under Rule 14.5 for hitting a moving ball and the score went down as a miserable 10. His explanation afterwards was another jaw dropper. OK, sounds simple so far, but should he really have been allowed to “move on” or should he have been disqualified and sent packing for breaking golf’s most sacred law of not playing the game with the integrity our sport demands? The Rules of Golf have seemingly impenetrable phrasing and meaning for us ordinary mortals to fathom but in my opinion there is another rule here that must step forward and take centre stage. When the USGA was challenged as to why Phil wasn’t disqualified under Rule 1-2 they cited this exception and stated his transgression was covered under Rule 14-5 with the penalty being two shots added to his score. So, as far as they, and Phil, were concerned, case closed. The USGA fudged it. Phil should have been disqualified but he is a much loved figure in the Shinnecock area and with numbers attending the championship lower than expected, I suspect they didn’t want championship Sunday without one of their main draws. Call me cynical if you like but money often seems to be behind decision making. 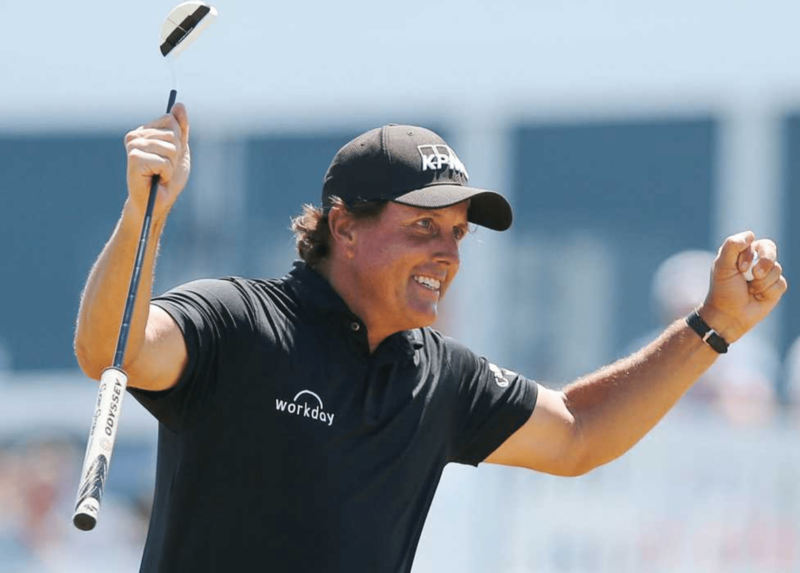 The general feeling among the players was that Phil had an agenda (doesn’t he always?) It was his way of saying to the USGA that the course had gone over the top and that they had repeated some of the mistakes of 2004. I can’t help wondering, however, what the ruling would have been had Joe Bloggs behaved in the same manner. It certainly wasn’t Phil’s finest hour and he has certainly lost many of his fans but I doubt he’ll be losing any sleep over it. On the third day I was out with Ian Poulter and defending champion Brooks Koepka in my role as on-course commentator for Sirius/XM radio. As the winds picked up and the course dried out it did indeed move beyond what I would call fair. Koepka, who would go on to win the title again, was unable to get within 40 yards of a couple of flags on the back nine despite beautifully executed, crisp, short irons. 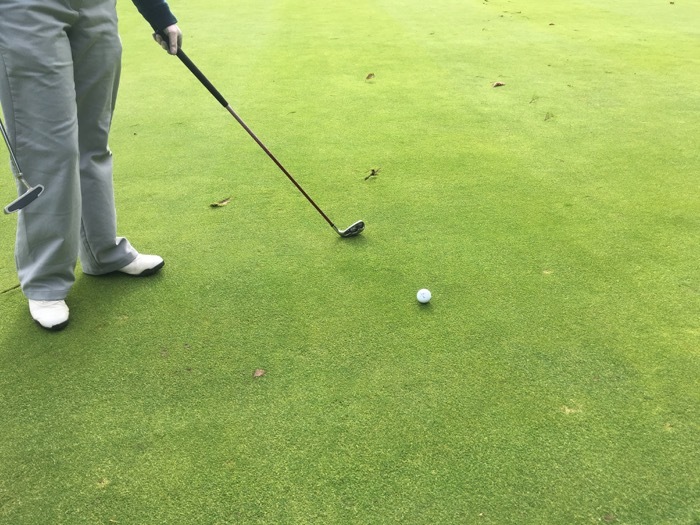 The severity of the slopes, coupled with the speed of the greens and the angles into the pins meant that good shots were not only NOT being rewarded, in many instances they were being penalised. That, to me, is when the course set-up is at fault. 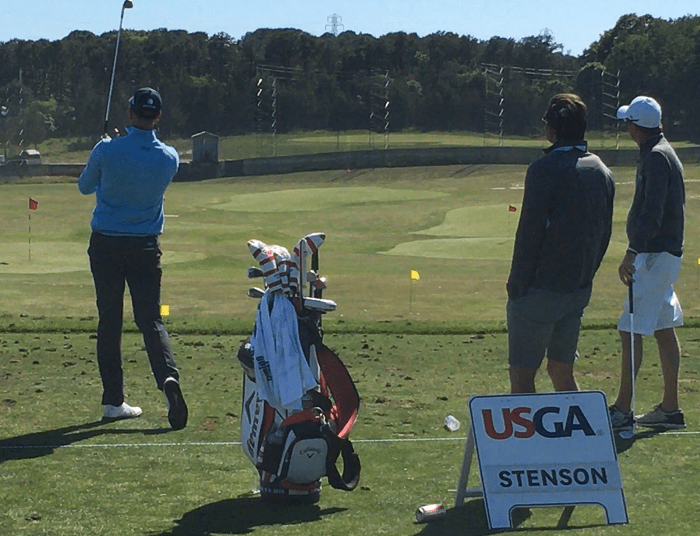 No need to trick this course up – even for a US Open. To their credit the USGA responded quickly with a beautiful set-up for the beautiful course on Sunday. They gave the greens a long drink of water to combat the hours of sunshine and drying winds and the pins were much more sensible, giving a quality shot a sporting chance of staying on the right section of green. In total 15 of the 69 players broke par on the last day with England’s Tommy Fleetwood playing the round of his life to shoot 63 and finish second. 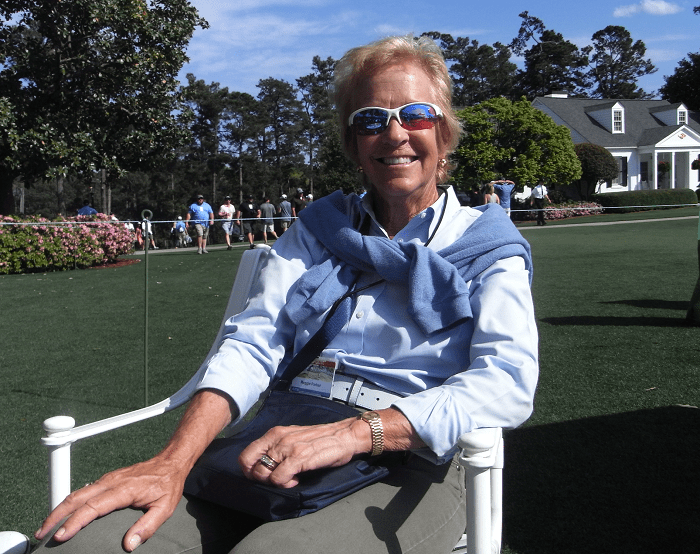 As regards course set-up there have been calls for heads to roll at the USGA but I think they have got away with it………..just. 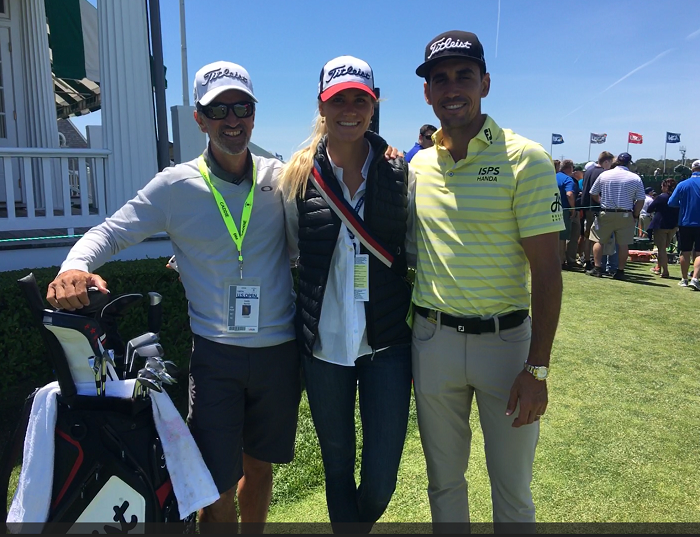 On a happier note, congratulations to classy caddy Ricky Elliott, a 41-year old native of Portrush who has steered Brooks Koepka to successive US Open titles. A pal of Graeme McDowell’s since boyhood, Ricky was one of the top juniors in Ireland in the 1990s. He turned pro, playing the mini tours in the States for three years before taking a teaching post. 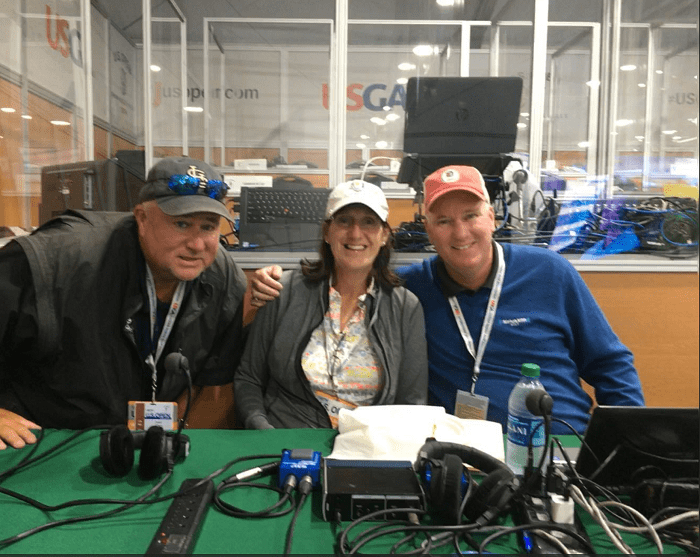 His caddying career began in Europe and he spent a couple of years with Maarten Lafeber and then a further three with Ben Curtis before getting the break of his life and being offered the chance to loop for Koepka. That was at the PGA Championship almost five years ago. And despite absolutely loving his time as a player he’s never looked back as a caddy. “When we were 7 over, he told me get it going, get it back. We’re not out of this thing. He was right. And just keep plugging away. There’s a lot of golf left. You never know what the conditions are going to do. I think he told me it was going to get easier, so just hang in there, and it did on Friday. Another major to add to Portrush’s list! It was sleeting when I left home last Monday. My husband was bemoaning the fact that we had reached April 2nd and the weather was not behaving in anything approaching a spring-like manner. It was curtailing his motorbike outings, you see. I do, however, remember several years of playing in the Helen Holm tournament in Troon in late April and being snowed off, so there’s no doubt that April has previous form in the snow department. My spirits picked up on my Virgin Atlantic flight to Atlanta – an abundance of legroom in economy is to be celebrated, especially when you are six feet tall and suffer from lower back pain from time to time. Mental note to self: fly more often with this airline. 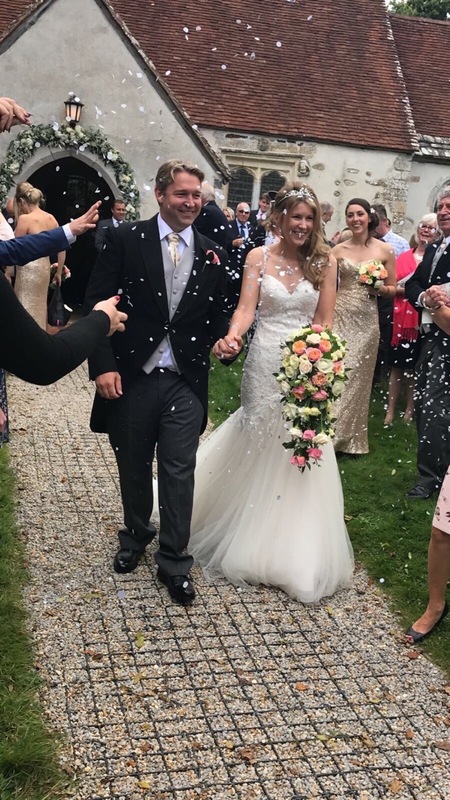 The good flight and even better subsequent night’s sleep meant I awoke refreshed, eager to embrace what I call my FDOY – Favourite Day of the Year. In other words, the Tuesday of Masters week. I’d better qualify that a bit. It’s only my FDOY if I’m actually AT the Masters AND working. If I’m lucky enough to be there and not working – well, any day that week could be my FDOY. And, of course, if I’m not actually in Augusta then the Tuesday is unlikely to measure up to the acronym. The treacherous sweep of the 13th hole. I don’t usually have any formal work commitments on the Tuesday so it’s my opportunity to walk the course and reacquaint myself with its wall-to-wall perfection. 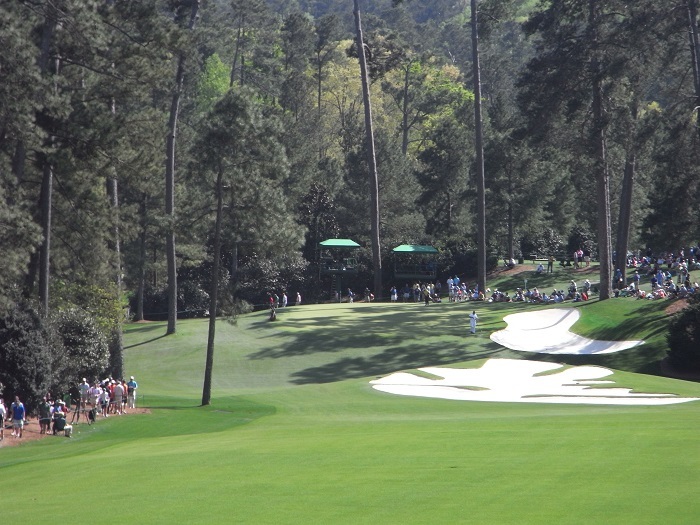 This week it was 29 degrees and easy to surrender willingly to the sensory overload that Augusta National provides, marvelling yet again that my memory has not played any tricks on me and that, indeed, the place is even more beautiful than I have remembered. 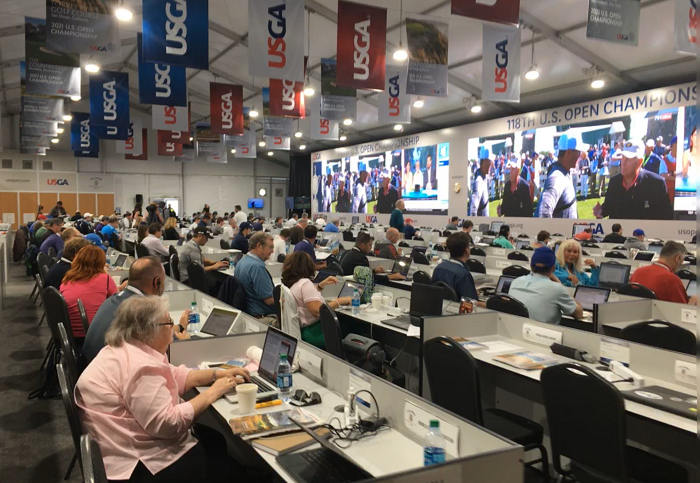 The smell and crunch of the pine straw beneath your feet, the aroma of big fat cigars and the reverential murmur of the patrons all conspire to fill you with anticipation as regards the tournament ahead. And yes, that birdsong that you hear on your television IS real, most definitely not piped as many of my pals back home have suggested! Downhill all the way to the 10th green. Against this backdrop is the opportunity to walk a few holes with players of my choice – Rory, Tiger, Sergio, the two Justins, Dustin, Bubba, Phil, Jordan, Henrik et al. Those I miss on the course I will try and spot on the practice ground, and, if I’m lucky, I may catch a wee word with them, their families, coaches or caddies. Tuesdays are fairly relaxed for the players. The nearer we get to the gun going off the less likely is an opportunity to speak to anyone outside of the formal interview areas and Tuesday’s comments can be quite revealing as to a player’s inner calm – or not. 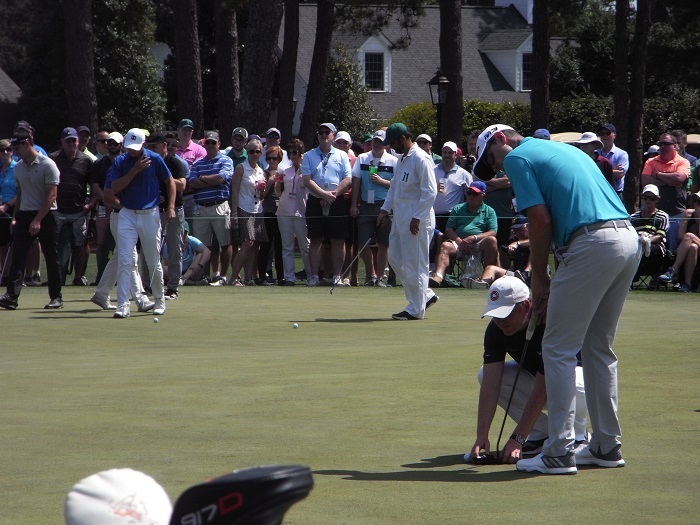 Justin Rose checking the putter face. 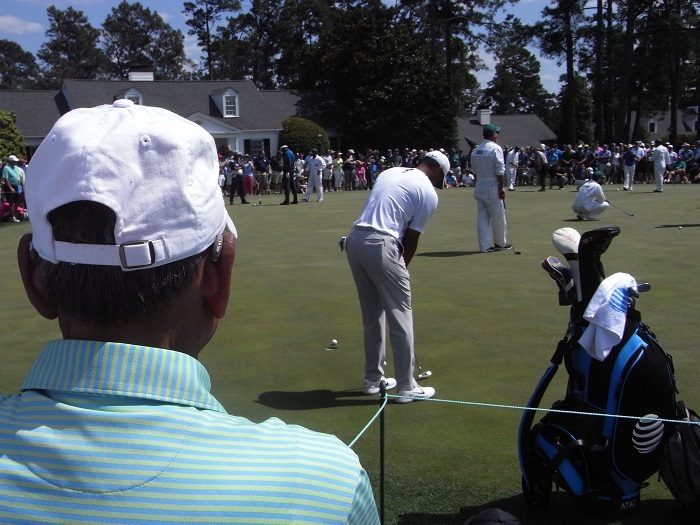 The man they’ve all come to see: Tiger. 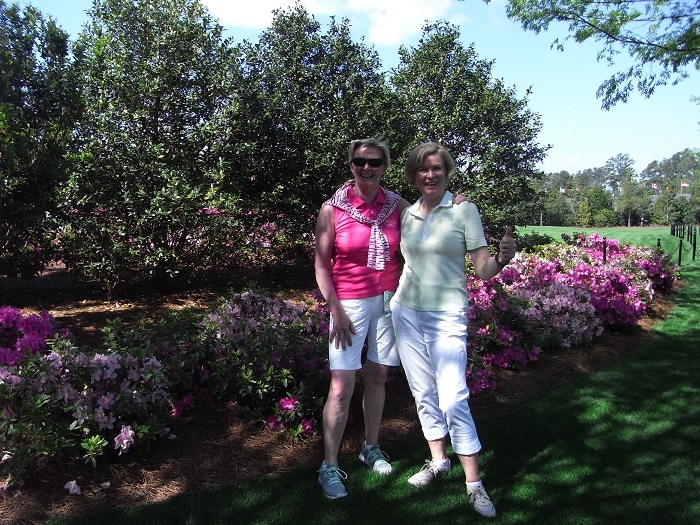 I like to have my lunch down at Amen Corner at one of the concession stands where the prices seem permanently frozen in the time warp of the 90s and the day is not complete without a visit to the famous Masters golf shop. This year it has increased substantially in size, seemingly effortlessly absorbing the old media centre and the whole experience of working my way down my extensive shopping list, nobly provided by my friends and family, was surprisingly easy. I find I become quite popular at this time of year. 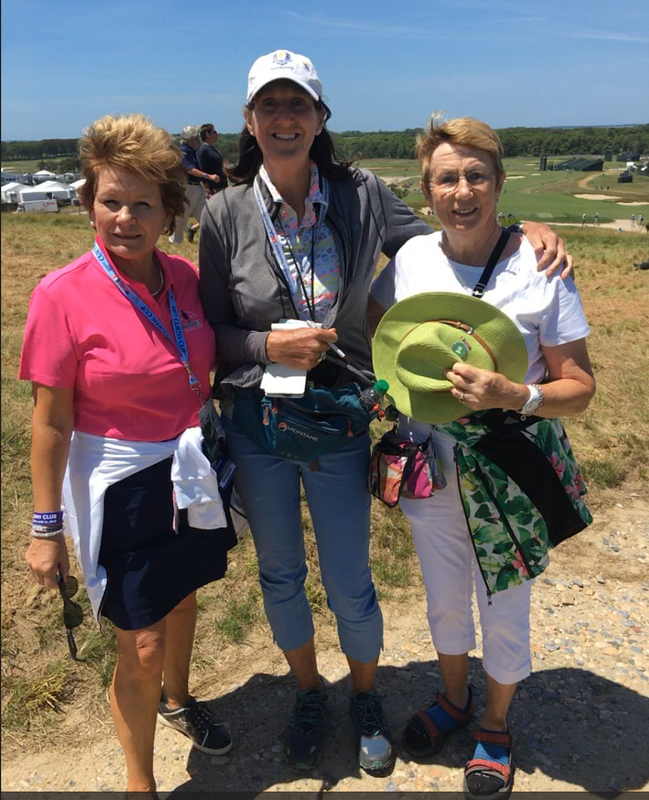 A chance encounter with Carol Wickham and Noleen Quirke, old golfing pals from Ireland. Sprinkled throughout this glorious day are meetings and encounters – planned and unplanned – with some of my favourite people in the print media, as well as my BBC colleagues and the American broadcast crews I have the pleasure of working with when in the States. This is the day to grab a coffee together, have a catch up on each other’s lives and draw a bit of a breath. As the clock ticks down towards Thursday morning and the moment the honorary starters take centre stage on the 1st tee time seems to accelerate at an alarming rate. For all of us in the media these are the calm waters before being hurtled over the brink of Victoria Falls – remember, this isn’t a major just for the players. A planned catch-up under the Augusta skies with Reggie Parker, US golfing pal of nearly 40 years. 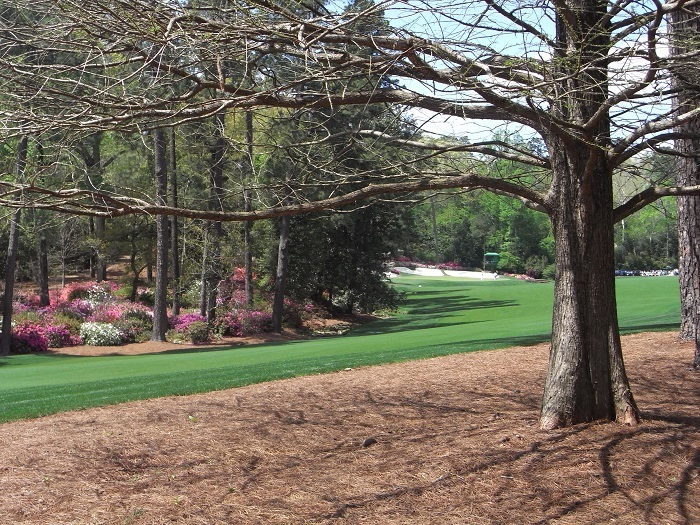 Masters Tuesday is a special day and one I look forward to and love. It is nourishment for the soul and doesn’t really have any close rivals for my FDOY……………hmm, unless, of course, a certain Irishman could manage to complete a Career Grand Slam. Then I’d just have to consider switching to Masters Sunday! “Don’t you ever get bored with playing golf?” my brother-in-law, an occasional golfer who has pretty well given up fighting with his clubs, asked. He said it with the air of a man baffled as to why anyone could be in thrall to this baffling and frustrating game. I’d just recited what I’d been doing over the last few days and it included rather a lot of golf of one form or another, ranging in quality from good to bad to indifferent to downright dire. Last Saturday, there was a ding-dong of a match at Whittington Heath in the mixed friendly against Beau Desert, where all four of us struggled to string a couple of good shots together but there was never more than a hole in it and Gareth, our opponent, hit a cracker of a 3rd shot to about 6 feet at the last to salvage a half. Undistinguished scoring perhaps but classic golf nevertheless. 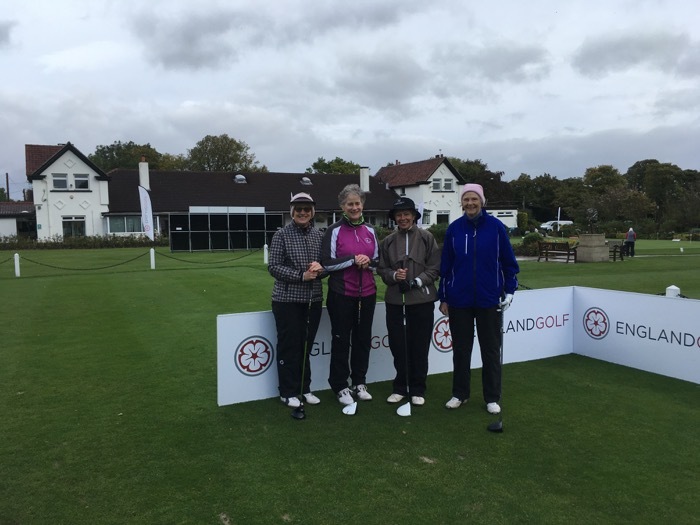 On Monday, in a howling gale, three of us headed to Nottingham to play a practice round at Wollaton Park, where the women of Whittington are due to play Branston Golf & Country Club in the final of the Taskers on Sunday. Well, strictly we’re competing for the Ian Burtoft Trophy and the men’s Taskers Trophy final is between Hillsborough and Lutterworth, with Chevin and Beauchief contesting the men’s plate. The teams are seven-a-side so it’s a big deal for those involved, with photo shoots, team briefings and a starter on the tee. If a stag is roaring, you make yourself scarce. 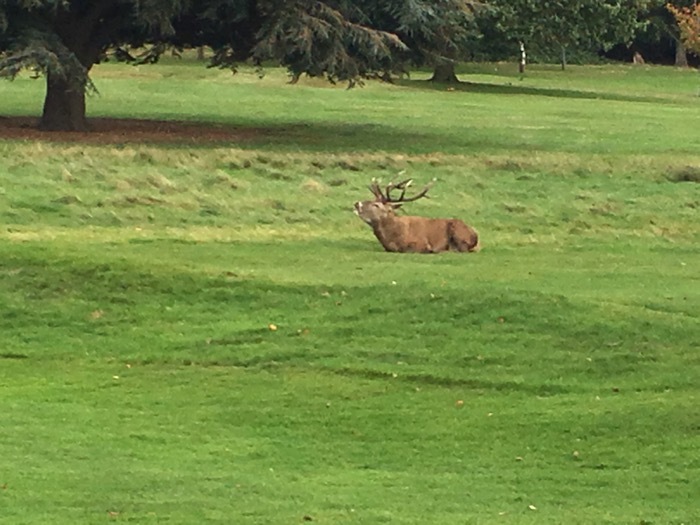 There’s the added spice of having to steer clear of the deer that roam the course – it’s the rutting season and the stags are not to be messed with. If they want to tramp across the green just as you’re shaping to putt, you give way and repair the hoof marks as best you can and if they choose to lie down in the middle of a fairway, you may need a free drop to negotiate a safe route to the hole. I drove at the 15th just as a stag with quite a harem decided to warn off a lone stag that had been lying quietly munching the grass on top of a bunker on the 14th fairway (we picked up there, not wanting to get caught up in a potential power struggle). The loner took the roars seriously and ambled onto the 15th, where he lay down plonk on our line 100 yards or so from the tee. 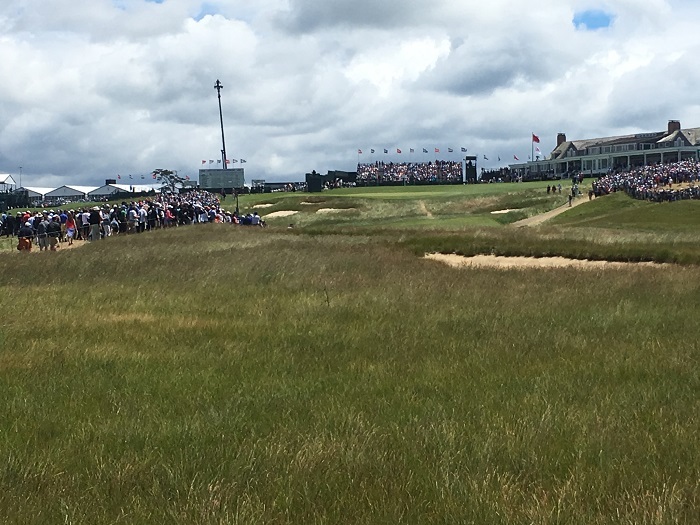 We weighed up our options, deleted bravado from the equation and walked to the adjacent 17th tee. Hoof marks: hardly a greenkeeper’s dream but the order of the day at Wollaton Park. Then it was off to Harrogate for another serious seniors’ comp, the Brenda King Foursomes, organised by England Golf no less and not my usual habitat, with names like Janet Melville, Pat Smillie and Sandy Catford dotted about the draw and Claire Dowling and Tracy Atkins on the list of distinguished winners. I was a late reserve and my partner Anne Fern was patience personified, as she needed to be as I struggled to do anything right. I love foursomes but it’s a tough old format if it’s strokeplay and every shot counts, very unforgiving for us ordinary golfers, especially in tough conditions – wind on the first day and rain, with a bit of breeze on the second – with the course playing long and giving you nothing. Anne, Patricia and the two Sues kitted for battle. On the golfing front, Anne and I were leagues away from the leaders – congrats to Amanda Mayne, of Saltford and Joanne Shorrocks, of Bigbury, who won for the third year in a row – but we were far from last and improved substantially on the second day in the teeming rain. One of the stalwart ball spotters, cheerful on a cold, miserable morning, told us he lived five miles to the east and his wife had rung to say she’d just hung out the washing! Sodden, we didn’t know whether to laugh or cry. 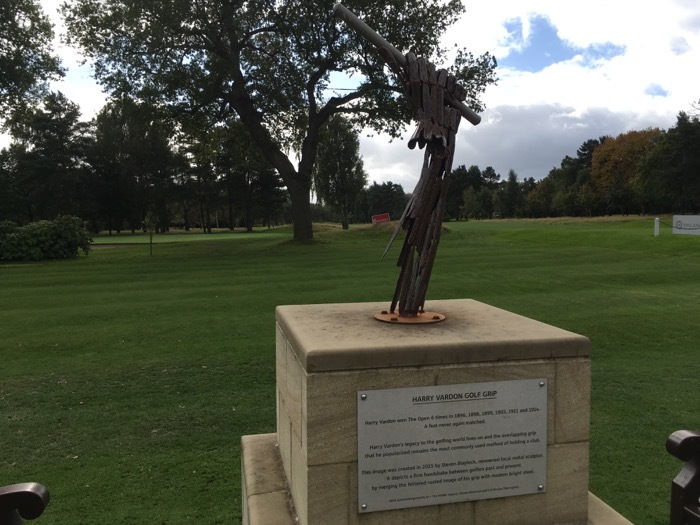 Harry Vardon’s famous grip providing inspiration on the way to the 1st tee at Harrogate. Maureen hates it when I try to squeeze in too much but more congratulations are necessary this week: to Whittington members Bev Chattaway and Sue Spencer, who were in the prizes at Harrogate, with their respective partners Caroline Corrigan, of Ingestre Park and Caron Harrison, of Sherwood Forest; to Catherine Lacoste, on the 50th anniversary of her victory in the US Women’s Open, still the only amateur to win the title; and to Bethan Cutler and Tristan Jones, two of the nicest people in golf, who work tirelessly on behalf of the LET and got married last Saturday. Every happiness.